Does your child constantly leave dirt and marks on the back of your car seats that are impossible to remove? Need your car seat backs cleaner and a life easier? The Lebogner 2 Pack Kick Mat Seat Protectors + Backseat Organizer is the answer!!! No more endless washing and scrubbing trying to remove the dirt or spending money on a professional cleaning service! LEBOGNER Kick Mats are designed to keep the back of your vehicle's seats clean, even when your child touches them with muddy shoes. 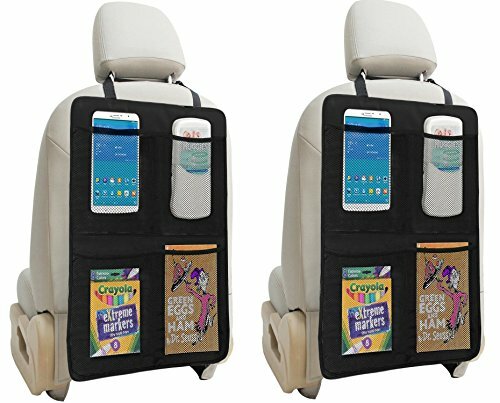 The 4 large organizer pockets on the front for handy storage of food or kids play toys will make your kids happy and you will have a neat car. ★ Waterproof, machine-washable fabric for easy care. ★ 4 large organizer pockets on the front for handy storage of food or kids play toys. ★ Kick Mats install in 30 seconds and come in packs of TWO. Hurry! Keep Your Car Seat Backs Cleaner And Make Your Life Easier By Adding This Amazing Lebogner KICK MATS + ORGANIZER To Your Cart Today!